Weapons in NieR: Automata are shown below. They are broken down into 4 types - Small Swords, Large Swords, Spears and Combat Bracers. There are a total of 40 weapons across all categories. Players can wield 2 sets of weapons at a time. For 2B and A2, each set is made up of 2 weapons. For 9S, each set is 1 weapon, since his Hacking takes the place of his second weapon. Your 2 weapons are bound to Triangle and Square buttons (X and Y on XBox controllers) respectively. You can assign the weapons in your weapon sets from the Weapons menu tab and in combat, you can press Up on the D-pad to swap your sets. Through the game's Crafting system you can use money and acquired Materials to upgrade your weapons at the weapons vendor in the Resistance Camp. Upgrading Weapons further unlocks their Weapon Story, which is a narrative description for every weapon that explores the history and background of the weapon. 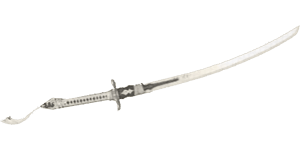 Weapons can be upgraded to level 4, with the weapons vendors taking them to 3 and Master Swordsmith Masamune handling the upgrade to level 4. Given the massive number of move combos there are between the three characters and that most of them are just different flavors of "generically swing weapon at enemy in combo to damage them" the entire move set will not be listed. The weapon combos of A2 and 2B are also nearly identical, the one exception being A2's Fast Charge attack with any weapon initiates a Taunt. However, the following are much more atypical attacks that are worth noting. SPEAR CHARGE: He throws the spear forward. CRITICALLY IMPORTANT TO REMEMBER! As long as he doesn't immediately do another attack to teleport it back to him the spear can hit past the max Lock On range and has excellent accuracy. The thrown spear does damage equivalent to roughly 3 normal attacks and pierces through enemies, has an area of effect slightly wider than the spear itself, and against very large enemies with multiple "sections" it may even hit multiple times for full damage each. Furthermore, even though it is a ranged attack it is still considered a weapon strike, AND WILL BREAK SHIELDS/ARMOR SECTIONS OFF OF MACHINES, who are normally immune to ranged fire while their shields are intact. The throw damage is still affected by Weapon Damage + skill chips, not Ranged. Even though the spear isn't as good for general combat against groups given its very narrow area of attack, this long-range throw can be excellent for boss fights when the boss is out of striking range, and can still be useful against smaller groups of normal enemies. Against closer enemies where you can fire it at full rate it can be launched almost as fast as Missile POD salvos, but will vastly out-damage what your PODs can put out.You should definitely consider having a Spear in your secondary weapon set and get used to switching them. It does, however, require Lock On to have any decent accuracy which means this becomes quite crippled at the higher difficulties where Lock On is disabled; manually aiming like what you can do with your POD has no effect on the spear. Note also that some machines will occasionally use a dodge move and avoid it. SMALL SWORD CHARGE: He throws the sword forward a small-ish distance and it hovers there spinning horizontally in place for several seconds, or until you attack again teleporting it to his hand. Given the slow launch speed and the tiny area of effect this is only really useful against very slow targets. DASH STRIKE: For all weapons, this makes 9S use the Heavy Attack combos. STRONG SPEAR RUN STRIKE: They throw the spear. This is much more clumsy and un-aimed than 9S's throw so you aren't likely to find it useful. In general 2B and A2 are much more suited to close-range combat, while 9S with his spear throws and hacks is vastly superior at range, though he can still be fairly respectable in close range combat with large swords being a particularly good choice. Small Swords in NieR: Automata will be shown below. There are a total of 13 Small Swords. [Route A,B] Resistance Camp Weapons Trader. [Route A, C/D] Abandoned Factory. [Route C/D] Flooded City Resource Unit. [Route A] Reward for Side Quest " Find a Present". [Route A,C/D] Popola and Devola's shop. [Route A] 2B's default weapon. [Route B] 9S' default weapon. [Route A] Quest Reward: 11B's Memento. [Route A,B] Just before the hanging bridge leading to the Shopping Mall, go right along the cliffs until you reach an elevator. Take it down and go left until you reach a waterfall. The dagger is in an unlocked chest near the pool. [Route A,B] Pascal's Village Weapons Trader. [Route A,B,C] Can be found by fishing in the sewer system between the City Ruins and the Amusement Park and in the sewer system between the City Ruins and the Flooded City. [Route A,B,C] Forest: Castle Front, on the area with huge arches where you fight a Goliath Biped. Go up a fallen pillar near the big wooden gate and platform along until you reach a chest with the weapon inside. Just need list or videos on how to find all the rare items/materials needed to fully upgrade the weapon(s). For example, where can I find a lot of machine arms. None of these weapons even have colors... That&apos;s pretty lame. Patterns might be interesting, but it&apos;s nothing until it gets color. I found the phoenix dagger when using the scanner in the desert when attempting to finish the "find the old world relics" mission that was in the desert. the pheonix dagger can be gotten a lot easier than that "find a elavator on the cliff" thing. Just jump down the gorge and float to the bottom. it will take you to the same exact spot. Why would they make the FFXV sword an option, but not include Caim&apos;s sword? HERESY I SAY!!! why is there two different numbers? does the weapons do random damage between these two values each hit or is the first number for light attacks and second for heavy? Virtuous Dignity (Spear), in the sewers between City Ruins and Amusement Park. Past the ladder that leads to the amusement park there is another ladder which leads to an area that contains the spear. Does this wiki really not have an option to add page change notes, or am I just missing something? Anyway, went and modified each of the individual weapon category pages, attempting to add clearer information as well as which routes you can find stuff in. I went ahead and reordered all the weapons too, to match what order they&apos;re listed in-game in. Also unified the formatting a little by doing things like removing empty lines between combo length listing (Shift+Enter is your friend!) and totally removing the columns meant to list weapon effects, since no one wrote a single thing in any of them. The Spears page was a huge mess of lacking information and I dare say I could not save it, though my additions hopefully are enough to make people actually able to find the things. As for this page, all I did was add the number of weapons that are in the game. ezpz. I would like to know... What is exactly that thing... Halo... In 2B&apos;s Back? ?